Venous thrombosis is a major cause of morbidity and mortality in the United States and a frequent cause of presentation in many emergency departments (EDs). [1, 2, 3, 4, 5, 6, 7, 8] The sequelae of deep vein thromboses (DVTs) range from the more common chronic venous stasis to the most serious pulmonary emboli (PEs). PEs have been described as one of the most common preventable causes of death, and approximately two thirds of PEs are estimated to originate in the lower extremities as DVTs. The rate of propagation from DVT to PE is estimated to range from 10-50%. [9, 10] Treatments with anticoagulation or Greenfield filter placement are extremely effective if used early, thereby underscoring the need for rapid diagnosis. Patients who have risk factors for DVT or pulmonary embolism (PE), and in whom a clinician suspects DVT or PE, should have workups that include, but are not necessarily limited to, bedside compression ultrasonography. No absolute contraindications to bedside ultrasonography for DVT exist. The patient should be supine with the leg in question exposed up to the inguinal ligament. Bedside ultrasonography for deep vein thrombosis (DVT) is performed in 2 principal positions, one for each area of examination. The images below depict ideal positions. Patient status and cooperation, however, ultimately determine what kind of positioning is possible. Ideally, 30-40 degrees of reverse Trendelenburg facilitates the examination by increasing venous distention. When examining the femoral vein, the patient should be supine with the hip externally rotated and flexed, as shown below. Patient positioning when assessing the femoral vein. When examining the popliteal vein, the patient needs to expose the popliteal fossa on the posteromedial aspect of the knee. The patient can either dangle the leg off the edge of the bed or bend the knee and externally rotate the hip, as shown below. If necessary, the patient can also be rolled onto his or her side or into the prone position. Patient positioning when assessing the popliteal vein. Set up the portable ultrasound machine at the patient's bedside, with the linear transducer set at a frequency of 5.0-7.0 MHz. Expose the patient’s entire leg. By convention, clinicians in EDs scan in an abdominal orientation with the probe marker pointed toward the patient’s head or right side. During the bedside ultrasonographic examination for deep vein thrombosis (DVT), the technician maintains this convention; that is, the probe marker points toward the patient’s right. In terms of orientation, remember that the top of the viewing screen is always where the transducer is touching the patient. Vascular anatomy is shown in the image below. 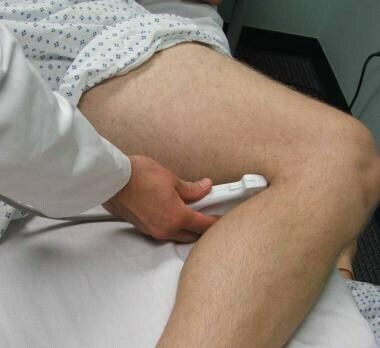 The video below demonstrates ultrasonographic evaluation for DVT. Demonstration of leg evaluation for deep vein thrombosis (DVT). Video courtesy of Meghan Kelly Herbst, MD. Also courtesy of Yale School of Medicine, Emergency Medicine. Position the patient as noted previously for examination of the femoral vessels (see Positioning, above). The study begins with an examination of the common femoral vein just distal to the inguinal ligament. The femoral vessels are located just inferior to the inguinal ligament and approximately midway between the pubic symphysis and the anterior superior iliac spine. The femoral artery is usually palpable. This is the initial point of examination. Apply gel to the transducer, the patient’s leg, or both, and position the transducer transversely, just distal to the inguinal ligament, as shown below. Remember, the indicator on the probe should point toward the patient’s right. In this transverse view, the vein is imaged in cross-section. Probe positioning for assessment of the femoral vein. Drag or fan the transducer in a cephalad or caudad direction until the junction of the common femoral vein and the greater saphenous vein can be visualized, as shown below. The common femoral artery is lateral to the common femoral vein. Ultrasonographic image of femoral vessels without compression. Using the transducer, apply direct pressure to completely compress the vein. If the vein compresses completely, then a DVT at this site can be ruled out. Be sure that enough pressure is being applied and being applied evenly. Apply enough pressure so that slight deformation of the artery is noticeable. If the vein is still not completely compressible, a DVT is present. See the image below. Ultrasonographic image of femoral vessels with compression. Compressibility must be present in both the femoral veins and the popliteal vein. Sometimes, the angle of the transducer may need to be adjusted in order to completely compress the vein. The greater saphenous vein is a superficial vein. A clot in the greater saphenous vein near its junction with the common femoral vein, however, can easily propagate. The examination of the common femoral vein should extend from 2 cm proximal to 2 cm distal to the intersection of the common femoral and greater saphenous veins. Distal to the greater saphenous vein, the common femoral vein splits into the deep and superficial femoral veins. 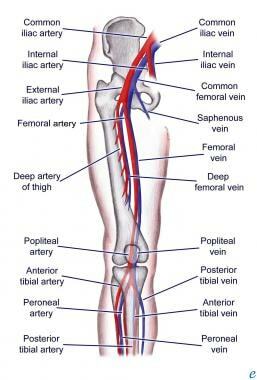 Despite its name, the superficial femoral vein is indeed a deep vein. Once collapse of both the deep and superficial femoral veins is confirmed, the examination may move on to the popliteal vein. Again, apply gel to the transducer, the patient’s leg, or both, and position the transducer transversely in the popliteal fossa, with the probe marker directed toward the patient’s right, as shown below. Probe positioning for assessment of the popliteal vein. Drag or fan the transducer in a cephalad or caudad direction until the superficial popliteal artery and vein are visible, as shown below. The popliteal vein is usually posterior to the popliteal artery. Given the posterior approach of the probe (transducer face is placed in the popliteal fossa), however, the vein appears more superficial (closer to the transducer face) than the artery. The popliteal vessels are compressed more easily, so reducing probe pressure may help visualize the veins. 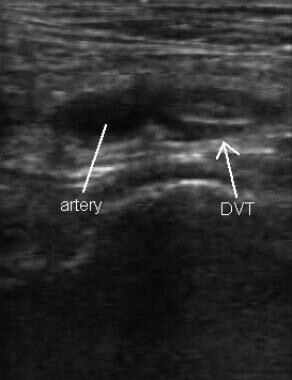 Ultrasonographic image of popliteal vessels with clot. The examination should include the distal 2 cm of the popliteal vein and the proximal aspects of its trifurcation into the anterior tibial vein, the posterior tibial vein, and the peroneal vein. Anatomic variability is not uncommon, and the popliteal vein is often seen dividing into the anterior and posterior tibial veins, with the peroneal vein then splitting off from the posterior tibial vein. Although not a formal component of the focused lower extremity compression examination for DVT, Doppler ultrasonography may be useful to help determine anatomic orientation and to further interrogate potentially misleading structures. Information obtained from Doppler ultrasonography alone, however, does not yield definitive evidence regarding clot presence. Doppler examination assesses the direction, velocity, and pattern of blood flow, with venous and arterial vessels demonstrating characteristic patterns. Normal venous vasculature should show venous flow at baseline, augmentation of flow with calf compression, and phasic respiratory ventilation with increased flow during expiration. In general, augmentation helps to assess for obstruction distal to the probe, whereas respiratory variation helps to assess for obstruction proximal to the probe (ie, iliac veins and inferior vena cava). 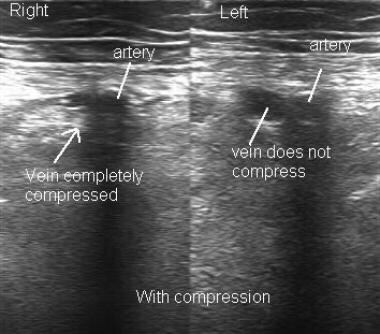 For the focused deep vein thrombosis (DVT) compression ultrasonographic examination, complete compressibility is the only absolute criterion to rule out DVT. Lack of compressibility is the only absolute criterion to rule in DVT. Documentation of the most proximal aspect of the clot is important to assess progression or regression of the clot after intervention. Direct visualization of a clot and Doppler flow abnormalities may suggest a DVT and, if clinically appropriate, may justify serial scans. Alone, however, these studies are limited in terms of their ability to definitively diagnose a DVT. See the image below. 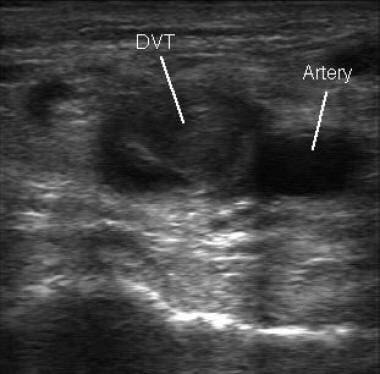 Ultrasonographic image of a deep vein thrombosis (DVT). The videos below depict an absence of DVT in the femoral and popliteal veins, respectively. Cine loop depicting absence of deep vein thrombosis (DVT) in the femoral vein. Video courtesy of Meghan Kelly Herbst, MD. Also courtesy of Yale School of Medicine, Emergency Medicine. Cine loop demonstrating an absence of deep vein thrombosis (DVT) in the popliteal vein. Video courtesy of Meghan Kelly Herbst, MD. Also courtesy of Yale School of Medicine, Emergency Medicine. Theodoro D, Blaivas M, Duggal S, Snyder G, Lucas M. Real-time B-mode ultrasound in the ED saves time in the diagnosis of deep vein thrombosis (DVT). Am J Emerg Med. 2004 May. 22(3):197-200. [Medline]. Blaivas M, Lambert MJ, Harwood RA, Wood JP, Konicki J. Lower-extremity Doppler for deep venous thrombosis--can emergency physicians be accurate and fast?. Acad Emerg Med. 2000 Feb. 7(2):120-6. [Medline]. Nunn KP, Thompson PK. Towards evidence based emergency medicine: best BETs from the Manchester Royal Infirmary. Using the ultrasound compression test for deep vein thrombosis will not precipitate a thromboembolic event. Emerg Med J. 2007 Jul. 24(7):494-5. [Medline]. [Full Text]. Crisp JG, Lovato LM, Jang TB. Compression ultrasonography of the lower extremity with portable vascular ultrasonography can accurately detect deep venous thrombosis in the emergency department. Ann Emerg Med. 2010 Dec. 56(6):601-10. [Medline]. Pomero F, Dentali F, Borretta V, Bonzini M, Melchio R, Douketis JD. Accuracy of emergency physician-performed ultrasonography in the diagnosis of deep-vein thrombosis: a systematic review and meta-analysis. Thromb Haemost. 2013 Jan. 109(1):137-45. [Medline]. [Full Text]. Mulcare MR, Lee RW, Pologe JI, Clark S, Borda T, Sohn Y, et al. Interrater reliability of emergency physician-performed ultrasonography for diagnosing femoral, popliteal, and great saphenous vein thromboses compared to the criterion standard study by radiology. J Clin Ultrasound. 2016 Jul 8. 44 (6):360-7. [Medline]. Whitson MR, Mayo PH. Ultrasonography in the emergency department. Crit Care. 2016 Aug 15. 20 (1):227. [Medline]. Anderson FA Jr, Wheeler HB, Goldberg RJ, Hosmer DW, Patwardhan NA, Jovanovic B, et al. A population-based perspective of the hospital incidence and case-fatality rates of deep vein thrombosis and pulmonary embolism. The Worcester DVT Study. Arch Intern Med. 1991 May. 151(5):933-8. [Medline]. Yamaki T, Nozaki M, Sakurai H, Takeuchi M, Soejima K, Kono T. Presence of lower limb deep vein thrombosis and prognosis in patients with symptomatic pulmonary embolism: preliminary report. Eur J Vasc Endovasc Surg. 2009 Feb. 37(2):225-31. [Medline]. Lensing AW, Prandoni P, Brandjes D, Huisman PM, Vigo M, Tomasella G, et al. Detection of deep-vein thrombosis by real-time B-mode ultrasonography. N Engl J Med. 1989 Feb 9. 320(6):342-5. [Medline]. Heijboer H, Büller HR, Lensing AW, Turpie AG, Colly LP, ten Cate JW. A comparison of real-time compression ultrasonography with impedance plethysmography for the diagnosis of deep-vein thrombosis in symptomatic outpatients. N Engl J Med. 1993 Nov 4. 329(19):1365-9. [Medline]. Seidel AC, Cavalheri G Jr, Miranda F Jr. The role of duplex ultrasonography in the diagnosis of lower-extremity deep vein thrombosis in non-hospitalized patients. Int Angiol. 2008 Oct. 27(5):377-84. [Medline]. de Oliveira A, França GJ, Vidal EA, Stalke PS, Baroncini LA. Duplex scan in patients with clinical suspicion of deep venous thrombosis. Cardiovasc Ultrasound. 2008 Oct 20. 6:53. [Medline]. [Full Text]. Frederick MG, Hertzberg BS, Kliewer MA, Paulson EK, Bowie JD, Lalouche KJ, et al. Can the US examination for lower extremity deep venous thrombosis be abbreviated? A prospective study of 755 examinations. Radiology. 1996 Apr. 199(1):45-7. [Medline]. Cogo A, Lensing AW, Koopman MM, Piovella F, Siragusa S, Wells PS, et al. Compression ultrasonography for diagnostic management of patients with clinically suspected deep vein thrombosis: prospective cohort study. BMJ. 1998 Jan 3. 316(7124):17-20. [Medline]. [Full Text]. Frazee BW, Snoey ER, Levitt MA, Wilbur LC. Negative emergency department compression ultrasound reliably excludes proximal deep vein thrombosis. Acad Emerg Med. 1998. 5:406-7. Bernardi E, Camporese G, Büller HR, Siragusa S, Imberti D, Berchio A, et al. Serial 2-point ultrasonography plus D-dimer vs whole-leg color-coded Doppler ultrasonography for diagnosing suspected symptomatic deep vein thrombosis: a randomized controlled trial. JAMA. 2008 Oct 8. 300(14):1653-9. [Medline]. Huisman MV, Klok FA. Current challenges in diagnostic imaging of venous thromboembolism. Hematology Am Soc Hematol Educ Program. 2015. 2015:202-9. [Medline]. Poley RA, Newbigging JL, Sivilotti ML. 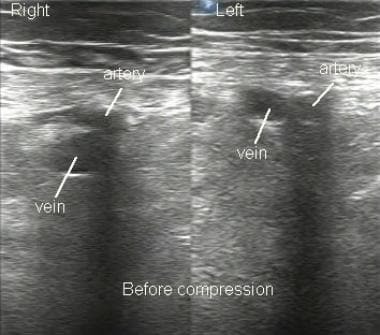 Estimated effect of an integrated approach to suspected deep venous thrombosis using limited-compression ultrasound. Acad Emerg Med. 2014 Sep. 21(9):971-80. [Medline]. [Full Text]. Bramante RM, Raio CC. Near-Miss in Focused Lower-Extremity Ultrasound for Deep Venous Thrombosis. J Emerg Med. 2013 Feb 21. [Medline]. Gillum RF. Pulmonary embolism and thrombophlebitis in the United States, 1970-1985. Am Heart J. 1987 Nov. 114(5):1262-4. [Medline]. Lund F, Diener L, Ericsson JL. Postmortem intraosseous phlebography as an aid in studies of venous thromboembolism. With application on a geriatric clientele. Angiology. 1969 Mar. 20(3):155-76. [Medline]. Useche JN, de Castro AM, Galvis GE, Mantilla RA, Ariza A. Use of US in the evaluation of patients with symptoms of deep venous thrombosis of the lower extremities. Radiographics. 2008 Oct. 28(6):1785-97. [Medline]. Ultrasonographic image of a lymph node.